Winner of the Elixir Press Antivenom Poetry Award in 2016. Contest Judge, Seth Brady Tucker had this to say about SELECTED PROVERBS: "Michael Brooks Cryer's poetry comes to us riding on static radio frequencies, channeled through the ether of our discontents and our vices; voices that purr and screech and caution us not to look away, but acknowledge that language is mutable, that 'In the beginning, the word was misused like a rag is misused when stopping up the mouth of a hostage.' We hear his epistles loosed by an array of voices, their visions cloudy and clear, strange and comforting; they show us, 'a gurney screech [ing] by with a ballerina on it,' they ask us to pay attention and listen. These poems are assured, lively, and filled with a caustic wit, and Cryer plays his poems like 'a bed of strings where [he] condition[s] your mood.' Let these sequences melt like wax candles over your HAM radio, put your ear to the leather ear pads, listen to this important voice." 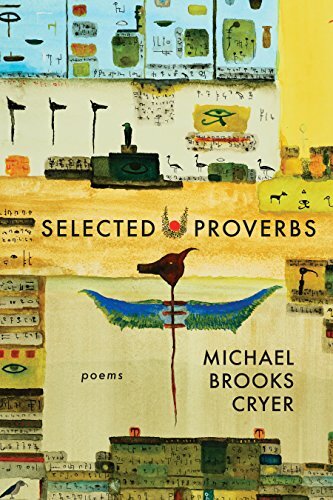 Michael Brooks Cryer lives in Phoenix, AZ and teaches writing at Arizona State University. His poems have appeared in Quarterly West, Ecotone, Hayden's Ferry Review, Spork, DIAGRAM and others. His chapbook, Channels, Frequencies & Sequences, was released by Four Chambers Press in 2017. He is also an occasional music critic for Phoenix New Times.